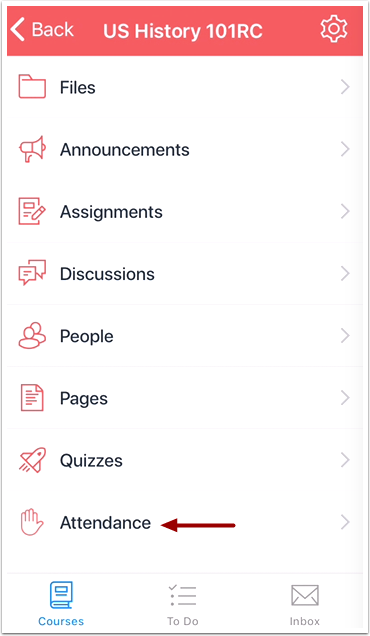 You can take attendance in your course using the Canvas Teacher app on your iOS device. Students cannot access the Attendance tool; only instructors have the ability to take attendance. However, students can see the Attendance assignment in the Assignments page and view their attendance report as part of the Roll Call Attendance submission details page. If you are using attendance for grading, students can also view their attendance grade in the Grades page. Note: The Attendance tool must be enabled by your Canvas admin before it can be used in your course. 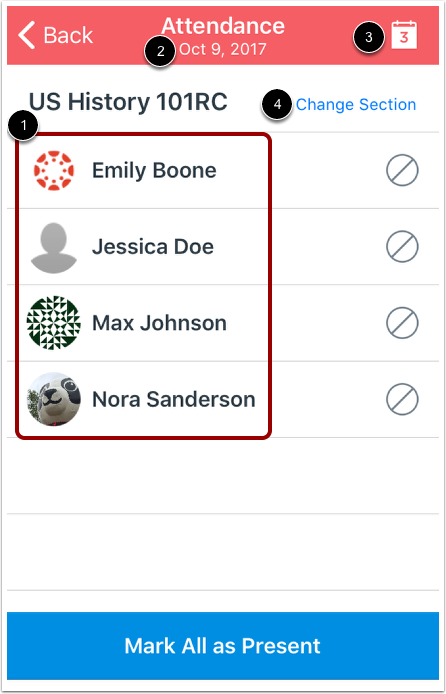 If you cannot see the Attendance link in the Canvas Teacher app, please contact your administrator. By default, the Attendance tool displays all students in the course  and the attendance status for the current date . To change the date displayed for attendance, click the Calendar icon . To filter the students displayed in the tool by section, tap the Change Section link . 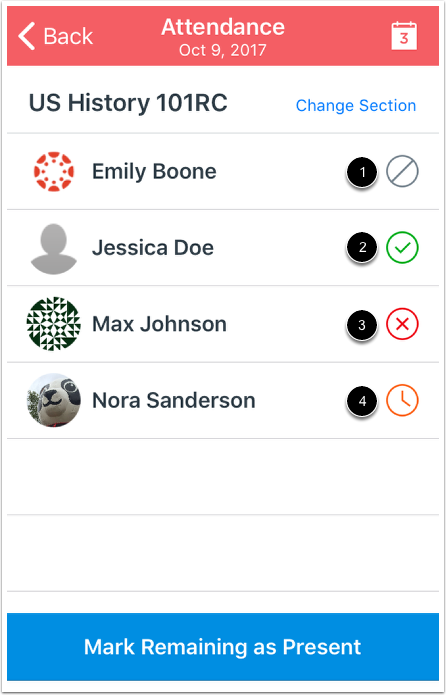 To change a student's attendance status, tap the Attendance icon next to the student . To mark all students as present, tap the Mark All as Present button . 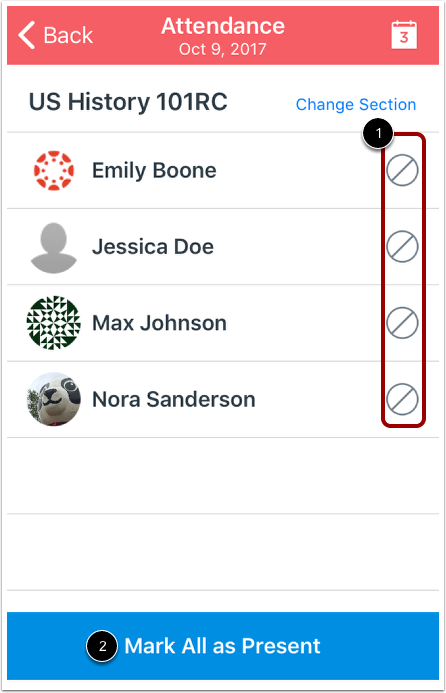 Note: Once you have marked attendance for one student, the Mark All as Present button will become the Mark Remaining as Present button. 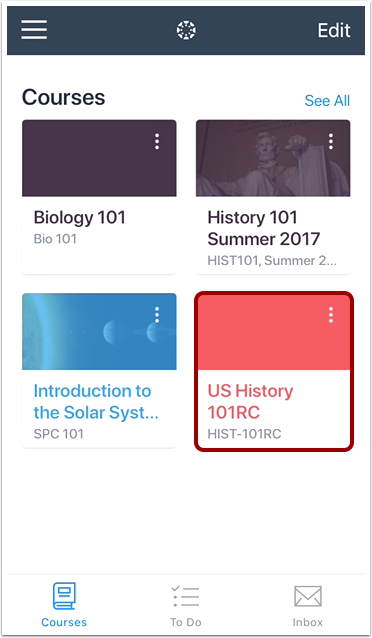 By tapping this button, only unmarked students will be marked as present. The gray No Symbol icon indicates attendance is unmarked . The green Check Mark icon indicates the student is present and on time . The red X icon indicates the student is not present . The orange Clock icon indicates the student is late . Previous Topic:How do I use the Rich Content Editor in the Teacher app on my iOS device? Table of Contents > Courses > How do I take attendance in the Teacher app on my iOS device?